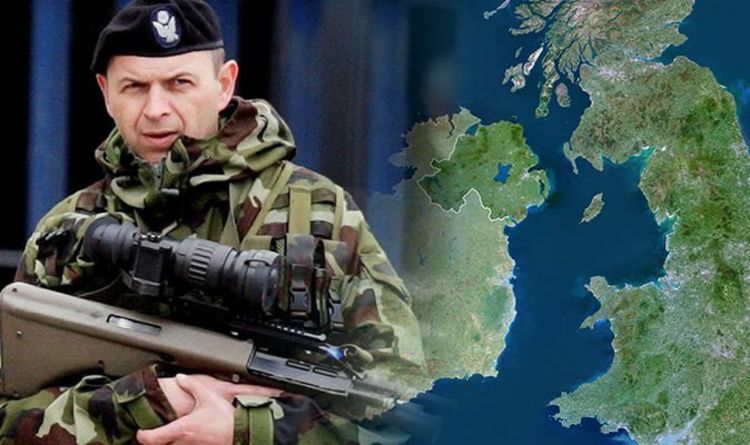 In a worst-case scenario, a hard border could "involve people in uniform and it may involve the need, for example, for cameras, physical infrastructure, possibly a police presence, or an army presence to back it up," Mr Varadkar said. He told Bloomberg: ”The problem with that in the context of Irish politics and history is those things become targets." Ireland has said it would find it difficult to avoid imposing a hard border on Northern Ireland if the United Kingdom crashes out of the EU without a deal. Discussing the border, Mr Varadkar said that at present it was "totally open" but "if things go very wrong it will look like 20 years ago". Asked to paint a picture of what a hard border would look like, Mr Varadkar said: "It would involve customs posts. "It would involve people in uniform and it may involve the need, for example, for cameras, physical infrastructure, possibly a police presence or army presence to back it up. "The problem with that in the context of Irish politics and history is that those things become targets, and we've already had a certain degree of violence in the last few weeks." The Irish government later clarified the taoiseach’s comments. They said in a statement: “The Taoiseach made it clear in the interview that the Government is determined to avoid a no deal scenario and the consequent risk of a hard border. “He was asked to describe a hard border, and gave a description of what it used to look like, and the risk of what it could look like in the worst case scenario. The open border is a legacy of the 1998 Good Friday agreement, which ended fighting between the north's pro-British unionists and nationalists who favour a united Ireland. Mr Varadkar last year warned of a “very real” risk of a return to the dark days of the Troubles in Northern Ireland if a hard border returned after Brexit. He brought in a copy the Irish Times, which featured the story of the blast which killed nine people in August 1972, to a European Union summit dinner last October. He told reporters: "I just wanted to make sure that there was no sense in the room that in any way anybody in Ireland or in the Irish government was exaggerating the real risk of a return to violence in Ireland. "I pointed out as well that we have gone now for nearly two years without a functioning Executive and Assembly in Northern Ireland. "The two parties representing the two communities in Northern Ireland have been unable to come together to form a coalition government, which they have been able to do for most of the last 20 years. "I met both leaders of the two main parties and they were both in agreement that the uncertainty around Brexit was one of the major reasons why they haven't been able to form an Executive, so we can see the uncertainty of Brexit is already having an impact, if we were to have a hard Brexit you can imagine the effects that could potentially follow." He described the article as "a useful prop to demonstrate to all the European leaders the extent to which the concerns about the re-emergence of a hard border and the possibility of a return to violence are very real". The period of history known as The Troubles was a sectarian conflict waged by the Irish Republican Army (IRA), initially against security forces Northern Ireland, starting in the 1960s, athough its root causes go back a lot further. On the other side were loyalist paramilitaries including the Ulster Volunteer Force. The IRA brought their campaign of violence to mainland Britain and were responsible for the Brighton bombing in 1984, which was an attempt to assassinate Prime Minister Margaret Thatcher, and which resulted in the serious injury of the-Conservative Party chairman Norman Tebbitt and his wife.